I first came to Amanda Hesser through her book Cooking for Mr. Latte, a “food memoir” of her courtship with her now-husband. While that book was cute and enjoyable enough, I was more excited at having discovered her cookbook, The Cook and the Gardener: A Year of Recipes and Writings From the French Countryside. Here is a cookbook after my heart: not only is it set in a château in France, it focuses on using seasonal ingredients, AND has great writing to boot. 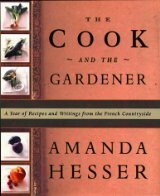 Hesser prefaces each chapter (corresponding to a month) with a couple pages worth of anecdotes about what was harvested that month, how it was dealt with in the kitchen, and best of all, her interactions with the crusty gardener, Monsieur Milbert. The third main character in this drama is the garden itself, whose caprices ultimately dictate the activity of Hesser’s kitchen and the moods of Monsieur Milbert. I have yet to cook many recipes from this book, but that is almost beside the point. In the spirit of trying to be more of a locavore, I have referenced it often before going to the farmers’ market, to get inspiration for seasonal menus and to see what produce I should be on the lookout for. (For those of you who assume everything at your farmers’ market is local and/or in season, think again- many markets, including Detroit’s Eastern Market, sell produce that has been shipped from CA or elsewhere. If you’re in doubt, don’t be shy about asking the vendors where their produce was grown.) Luckily, the region of France where the book takes place has a similar growing season to Michigan, so the recipes for any given month correspond to what’s available here. One big hit was the Red Beets with Shallots and Sage- I have brought this to two potlucks, and both times people who thought they hated beets changed their minds after tasting it. If anyone else out there owns this book, let me know what recipes you’ve tried. Meanwhile, I’ll be checking to get ideas for the lean season ahead, and waiting impatiently for the first asparagus to hit the markets in the new year.